Trey Adams, UW’s mountain of a left tackle, got bigger. Now he wants to get better. Junior Trey Adams, the Huskies’ mountain of a left tackle, is even bigger this season, and is working hard to get better in every aspect of his game. This is not good news for opposing defensive linemen. That’s got to be scary for those who oppose Adams, who added 10 pounds in the offseason. 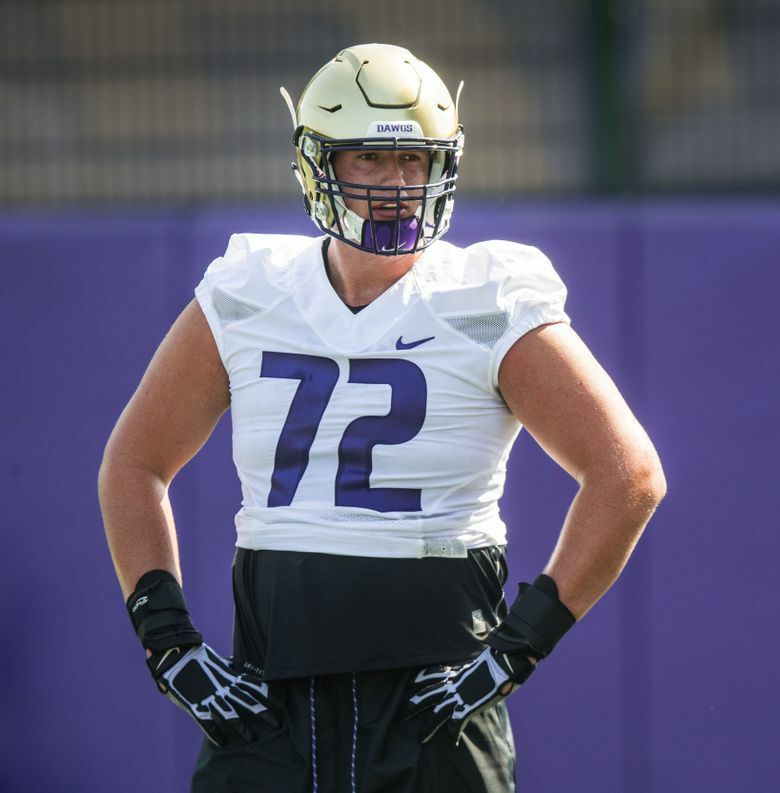 He is listed at 6 feet 8 and 327 pounds and is well on his way to becoming one of the great offensive linemen in UW history. He started nine games at tackle as a true freshman and last season, as a sophomore, was first-team All-Pac-12 and a second-team All-American by the Football Writers. Expectations are high this season, not only for Adams, but for the offensive line, which lost starting left guard Jake Eldrenkamp to graduation but is otherwise intact. But Adams, who starred in football and basketball at Wenatchee High School and is unnaturally agile for a man his size, seems unfazed by the accolades coming his way. Adams said he put on the 10 pounds by “eating good” and working out every day. He also credited the team’s strength coach, Tim Socha, whom Adams said is awesome. Adams also spent time hanging out with his fellow linemen. Adams has impressed Scott Huff, the team’s new offensive-line coach. Huff noted that while Adams has started for two seasons, he is just in his third year in the program as a true junior. The coach agrees with Adams’ assertion that there are many areas in which he can improve. “He’s got a lot of things to get better at, and he would be the first one to admit it,” Huff said. “He’s really only played two years. He has a lot of experience but he’s still growing, getting stronger and coming into his body. Setting quantitative goals for a lineman is not easy, but Adams does have a list of things he wants to achieve. But Adams realizes that he is just one cog in the offensive line. He said that for a good play to happen, all five linemen need to do their job. Huff, after the first few days of practice, likes the group’s attitude. “They’re a great group of guys and they’re willing to work and compete and those are the two most important ingredients,” Huff said. Adams was a high-school teammate of Washington State All-American guard Cody O’Connell, who at 6 feet 9, 368 pounds, is one of the few players Adams literally looks up at. The two played together at Wenatchee when Adams was a sophomore and O’Connell was a senior. And Adams’ take on two of the best and biggest linemen in the country coming from Wenatchee?